Imagine this scenario. You are a faculty member who has just been asked to teach a new course in anthropology, Mythology and American Culture, in Summer 2000. It is currently March 2000. This would be the first time you have taught the course, and although you are an expert in the field and have access to a considerable amount of information, the design of the course content is new. Now imagine that you are asked to deliver a section of this course as an “online course” to a group of 15 anthropology students. You currently have a four-class, two-prep teaching load, advise students, and serve on faculty committees. How do you get ready? How do you design an online course that is as effective as those that you teach in person? How do you learn about and use technical and instructional resources to construct and test this course in four months? In many aspects, the design of an online course is similar to that of its in-person counterpart. The content is still based on learning outcomes and course goals. In addition, the course schedule is still a balance between including what students need to learn to accomplish the course objectives and the time available. A key challenge is to create an environment in which the students do not need to rely on face-to-face contact to learn material. This environment should include several basic components: access to course materials (online and offline), comprehensive course management tools for students and faculty, opportunities for self-assessment, formation of online communities, and formative evaluation of the course. Other components that could add to the learning experience include: the use of active learning, experiential learning, and service learning strategies to design content; development of self-paced tutorials and activities to provide structured learning; and utilization of online testing and scoring techniques for additional student assessment. Let’s assume that the faculty member who has been asked to teach our fictitious anthropology course has completed most of the overall planning by designing course objectives, analyzing the audience, and framing an outline of the course content. He or she has reached a point where online materials need to be constructed and learning activities designed. Also, conventional lecture materials need to be adapted to serve as online learning tools. Where should this faculty member begin? First steps should involve conducting a search for other online courses to form a baseline for what type of environments have already been created. This research process will help to shape the online course and provide ideas about content to include and activities to structure. The next step should involve seeking help from campus resources, i.e., a Center for Teaching Excellence or Experiential Learning to help shape learning activities, and a Center for Instructional Technology to provide guidance in adapting materials from a conventional classroom for online use. Since the amount and availability of assistance will vary from place to place, let us consider two approaches: faculty-designed/faculty-developed, and faculty-designed/IT-developed. In the first approach, our anthropology professor has received assistance with designing learning outcomes and activities from the Center for Teaching Excellence and is ready to begin developing materials. 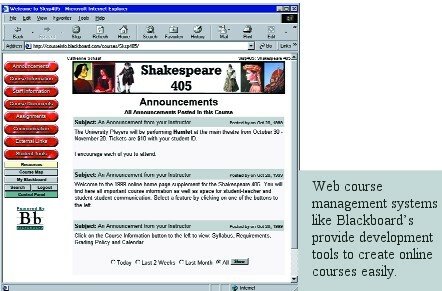 The IT Department isn’t staffed to handle the course development, but a designer has suggested using a Web Course Management tool such as Blackboard.com to allow the instructor to construct the materials for the course Web site without learning HTML. Such packages allow instructors to build a basic framework of a course site without learning HTML, and offer features such as tools for creating online discussion environments as well as online quiz construction. Several companies provide product training and instructional design support for a premium fee. Assuming our anthropology professor chooses this option, he or she would be able to use fill-in-the-blank templates to construct a syllabus, course schedule, online discussion area, and even an online quiz in a few hours. What our professor has at this point is a “framework” or starting point for an online course. The reason these packages cannot be used exclusively to construct courses whose delivery is 100 percent online is that the course templates alone are often insufficient to provide a structure in which to develop content. To accomplish this next step will require that the professor develop Web-based materials. Since developing materials takes time regardless of the software tools used, students can help to fill in the gap. Students, as we have found at St. Edwards, are an invaluable resource when it comes to course construction. If our anthropology professor can find a technology-savvy student with good communication skills, she or he may be able to offer financial and/or credit incentives to produce instructional materials. Once technology tools are recommended and the student trained, other students can take content in the form of lecture notes or images and compile them to be uploaded to the Web. In this model, it is very important that our professor provide content to the student and also serve as a guide to ensure that deadlines are met. In the second approach, our professor has the added benefit of an Instructional Technology department that offers instructional design and course development support. In theory, the IT department could offer instructional design assistance in developing the course. At St. Edwards, a trained student is hired for the task of developing materials. As with the previous model, student talent is utilized to produce materials. The difference with this model is that faculty have the option of letting the instructional designer help manage the development of the project as well as supervise the students’ progress. The instructional designer can help the professor customize the online delivery to meet the objectives of a particular lesson or of the course. The instructional designer is also responsible for training the faculty in the use of the instructional tools needed to produce the course. In this model, could the professor ask the on-staff designers to develop the course? What role should she or he play in the development? To get the most out of this arrangement, it will be up to the professor to continue to provide IT staff with materials in an organized format, with content outlines, word-processed documents, PowerPoint slides, images selected for scanning, and selections of audio to be recorded. Under a normal timeline at St. Edwards, this course development would begin during the summer session and continue for as long as needed. During this process, faculty members are trained to their level of interest, whether it be savvy content expert or independent designer of online course materials. Even at St. Edwards, where there is a fully staffed IT department, some faculty have developed courses independently while others have relied completely upon IT. While the level of involvement among faculty members may vary according to level of interest and time available for the project, the development of online course components remains similar. As a consultant giving advice to the anthropology instructor, I would suggest taking a careful look at the construction of the online discussion environment, in addition to developing content. Although it is perfectly valid to construct just one overall discussion group that functions as a “bulletin board” for a course, this is often insufficient in creating connections among students, even when used in conjunction with e-mail and synchronous, or live, chat. Online discussion areas can be created to support group-oriented projects, or case-based problem solving. Discussion-oriented assignments can also be constructed so that students have the opportunity to facilitate and lead group discussions. In addition, by linking directly to a discussion group thread from the course content, faculty can immediately engage learners by posing questions for thought. Isolating discussion topics from the larger group list has the potential for reducing off-topic responses—not to mention preventing messages from straying into other threads. As with many other areas of Web course development, there is no single correct way to utilize discussion systems. Our anthropology professor would benefit from collaborating with other faculty who have tested online discussion methodologies in their courses, and implementing vaulable experiences. This tactic also works well while constructing online quizzing and assessment exercises for students. Although there is no single approach to using online quizzing programs, faculty are often advised to build them routinely into the content of the course, not just as an “add-on” at the end of a module. An online quiz is especially useful as a self-assessment measure for students in an online course, as it provides a self-paced mechanism for tracking progress. What lies beyond developing the online course after the content is designed and developed, discussion areas created, and assessment modules designed? Our anthropology professor has been very careful, we assume, to construct a class that is ideally suited to the online environment, but has she or he ever taught online? If the answer is no, it would probably be a good idea to get acquainted with the process of delivering a course online. The best way to accomplish this goal involves two steps: communicating with other faculty experienced in teaching online courses, and participating in an online course as a student. In an ideal environment, this type of training could be delivered in a “workshop” format. The workshop could provide opportunities for faculty to discuss managing an online course, keeping up with course communications, and providing student assistance. Based on figures given by William Gaud (Syllabus, December 1999) from Northern Arizona University, faculty can potentially spend up to 30 hours a week writing for and managing an online course—not including grading time. Collaborating with other faculty may reveal strategies and methods of delivering an online course that could help reduce startup time. In addition, the workshop could give faculty the experience of playing a student in an online course. Many good teaching practices are developed by taking the best scenarios that we all experienced as students and adapting those techniques for our own classroom. Since so few faculty have actually been students in an online environment, it can be difficult to relate to an online student’s unique experience. Even if a workshop format is not available from your IT department, the same objective can be reached by taking online professional development workshops that cover topics ranging from pedagogical issues to HTML training. They are routinely advertised on several professional listservs such as POD (Professional Organizational Development), Support of Faculty Using Computing Technology in Higher Education (sponsored by University of Connecticut), and Steven Gilbert’s TLT Group list. As students begin to demand more from their online experience, faculty will be encouraged to add more depth to their online courses. This is particularly true with online degree programs. Since program choices are not limited by physical borders, the requirements for online courses to contain highly interactive content, well-developed online communities, and self-assessment tools to chart student progress will become increasingly important to schools interested in recruiting and keeping an online audience.